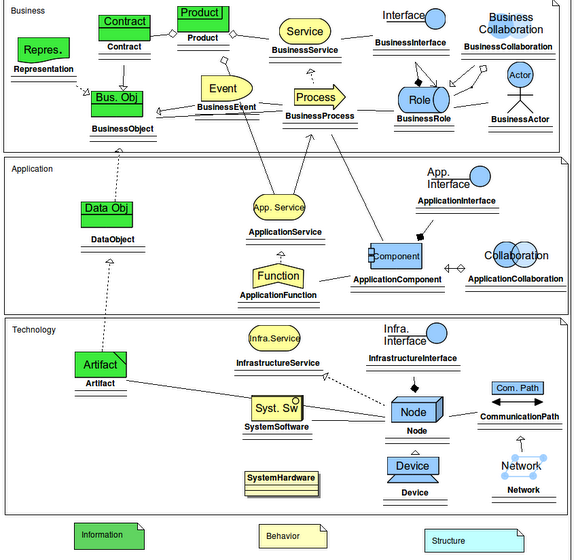 There are several models for representing an Entreprise Architecture. A simple notation for representing Entreprise Architectures is Archimate. The model is simple. It describes 3 views (Business, Applications, Technology) of 3 concepts (Information, Behavior and Structure). The current architecture (AS-IS) and the future architecture (TO-BE) can be pictured using Archimate. The objectives of the evolution are captured using a “motivation framework”, for example a goal tree.